House Speaker Paul Ryan, R-Wis., speaks to the media during his weekly news conference at the Capitol on Thursday. "We believe our first duty is to this country, and the president continues to act in a manner that is detrimental to the health of our republic," said the anonymous official. Ryan responded by saying that Trump administration officials should either work to help the president or resign. "A person who works in the administration serves at the pleasure at the president; [The New York Times op-ed writer] is obviously living in dishonesty," he told reporters at his weekly press conference. "It doesn't help the president. If you're not interested in helping the president, you shouldn't work for the president, as far as I'm concerned." 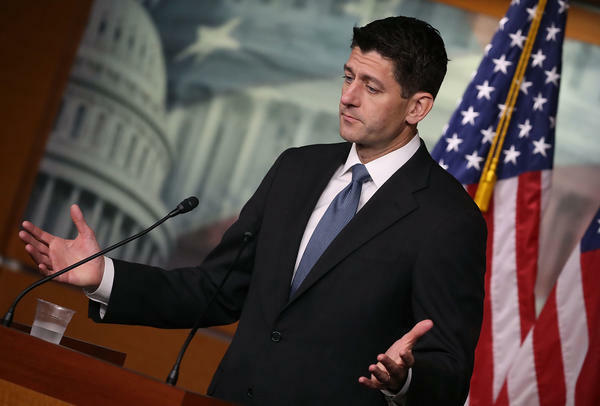 Ryan has been an occasional critic of the president's, and the two clash on issues like tariffs, Russia and immigration. Still, the speaker emphasized what he believed were the positive results coming out of the Trump administration's actions, like the rising economy and increased military spending. "What I concern myself about are the results of government. And the results of government are good results," Ryan said. "I know the president is very unconventional. And I know his tweeting and unconventional tactics bother people ... our branch of government is in charge of making sure that we pass good laws that improve people's lives. And guess what, we are passing good laws that improve people's lives." The identity of the anonymous op-ed writer has become something of a parlor game among those interested in national politics. Members of the Republican Party from staunch Freedom Caucus allies to erstwhile presidential competitors are urging the writer to name themselves and resign. While Ryan thought that there was no role for Congress to investigate the identity of the writer, close Trump allies like Rep. Mark Meadows, R-N.C., said there was a national security component to this saga that might require oversight. Meadows said that the individual might be having "highly sensitive and classified meetings within the Oval Office" even while resisting the president's decision-making process. "We're looking at what is proper from a legislative branch standpoint. We have oversight over the executive office of the president and federal employees ... under my subcommittee," he said. Rep. Lee Zeldin, R-N.Y., another Trump ally, added to the calls for the writer's resignation. "I don't believe that that person is doing a good service to faithfully execute their job. ... That person should not be inside the administration, and they should submit their letter of resignation and move on to something else," he said. Sen. Marco Rubio, R-Fla., tells NPR's Steve Inskeep that if a member of the administration no longer feels he or she can serve the president, that person should resign and feel free to speak publicly about any concerns. "What I don't think is appropriate is to say, 'I'm still working here, but here are the things we are doing to undermine a duly elected president.' " Rubio said. "Because that runs counter to our constitutional republic. That is the role of Congress and ultimately the role of elections." Secretary of State Mike Pompeo, among others, made it clear he wasn't behind it and said it was "disturbing" that the Times printed it. "It shouldn't surprise anyone that the New York Times, a liberal newspaper that has attacked this administration relentlessly, chose to print such a piece," Pompeo said. He told reporters the paper should not have taken a "disgruntled deceptive bad actor's word for anything and put it in their newspaper" and dismissed it as an effort to undermine the administration. House Minority Leader Nancy Pelosi made light of the op-ed at her weekly press conference on Capitol Hill and tried to pivot away from it and toward her party's agenda. "It probably won't take us too long to figure out who wrote it. ... The vice president, that was my first thought," Pelosi said Thursday, laughing. "Dan Coats, Pompeo — they denied that they had written it. I guess by process of elimination, it will probably come down to the butler. ... But you know what, it's an op-ed in The New York Times. We are focusing on the well-being, the kitchen table, the concerns of America's working families. " The White House, and the president himself, have lashed out against the op-ed. The president called the individual "GUTLESS" on social media, and White House spokesperson Sarah Sanders called the anonymous writer a "coward." In an unusual statement, the president even demanded that The New York Times reveal their source "for national security purposes." Even the first lady, Melania Trump, issued a rare statement to weigh in. "Unidentified sources have become the majority of the voices people hear about in today's news," she said. "If a person is bold enough to accuse people of negative actions, they have a responsibility to publicly stand by their words and people have the right to be able to defend themselves. To the writer of the oped – you are not protecting this country, you are sabotaging it with your cowardly actions." The divisions within Trump's administration are hardly new. Since Trump's inauguration in 2017, there have been a consistent flow of resignations, internal dissent and public protestations even within his own Cabinet. In fact, many of the most prominent dissenters are officials within the so-called "shallow state" — those close to the president who publicly show that they are disconnected from what the president says or tweets.